Utagawa Kuniyoshi (1797-1861) Twilight Ken, 1827-1830. Oban diptych. This enigmatic print is again not what it seems. It appears to show a group of geishas entertaining a wealthy samurai at a brothel or tea house. Well, all of the characters here are male… there were no female kabuki actors and these are all portraits of popular actors of the day. The scene is probably from a dance interlude during a performance of a long kabuki drama. They are engaged in playing the game of Ken, a game played with the hands, similar to rock-paper-scissors. 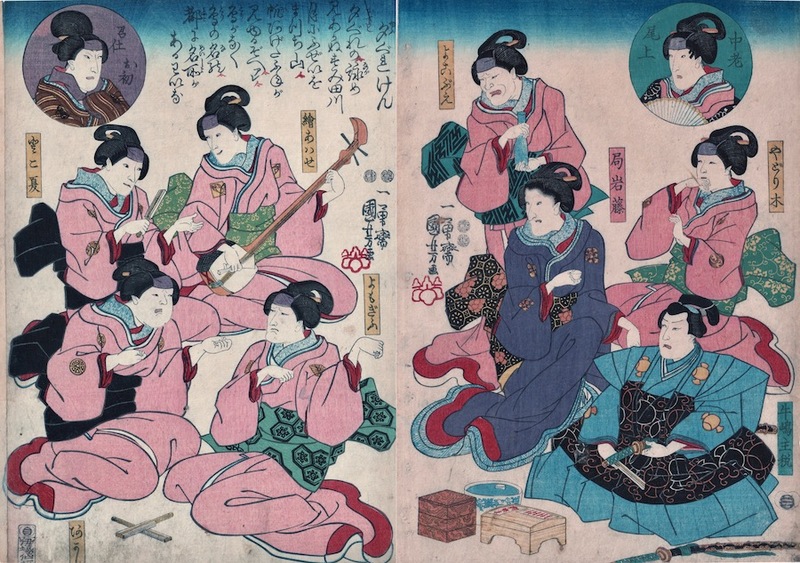 Kuniyoshi made several prints of actors playing this game, possibly because it allowed him to play with the unusual hand gestures involved in the activity. Prints depicting the game of ken are called ken-no-e. Ken was often played as a drinking game and was incorporated into several kabuki plays as a dance. The prints with small human figures illustrate the dance steps. After the imposition of a ban on actor prints in 1842, Kuniyoshi produced many humorous designs with thinly disguised actors’ portraits as animals or other objects playing ken. A fine and collectible print, a genre subject of great interest and quite a rarity. Colour, condition and impression are all excellent.